May | 2014 | Really??! May 2014 – Really??! It’s been 12 years since my first Mother’s Day as a mom, and while I know that the first one seems like it should be the most meaningful, for me at least, it definitely hasn’t been. I’ve had 12 years to think about what being a mom means. I know that in comparison to lots of other moms, I don’t have a lot of years under my belt. I know I’m not an expert on parenting, but I’ve become an expert in being a mom to my own kids. And I’ve learned that (again, for me, at least), being a mom just keeps getting better. And that I continue to learn more every day about being a mom. I’ve learned that one of my kids has figured out how to leverage his cuteness to negotiate everything from 5 more minutes of awake time to convincing me to tie his shoes (even though he’s known how to do it himself for 3 years). I’ve learned that while I want to put on a jacket in 50-degree weather, an adolescent boy will say that he’s perfectly comfortable in shorts and a t-shirt. And I’ve learned that this is not a battle I’m going to choose to fight. Eventually, if he’s cold, he’ll put on more clothes. Even if it’s not for another 10 years. I’ve learned that little kids will eat just about anything if you put it on a toothpick. And that sometimes, that trick works for grown men too. I’ve learned that parenting isn’t fair. You’re going to give way more than you get, whether that’s in work, worrying, sleep or back scratches. But I’ve also learned that it is beyond worth it. I’ve learned that when it’s my child’s heart that breaks, I feel it too. I’ve learned that many of my own quirks and shortcomings have, ironically, made me a better parent. That I have nearly endless patience with my kids when they worry about things that worried me as a child. And through them, I’ve learned to retroactively forgive myself for not being the perfect child I thought I needed to be. 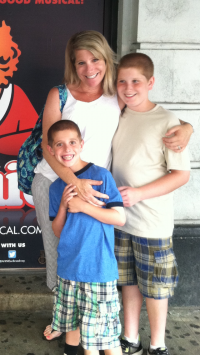 I’ve learned to be thankful for the different things I enjoy with each of my boys. My older son and I watch silly TV shows together, eat pancakes at diners, play music together and make sarcastic jokes. My younger son and I love to read and snuggle together, will try every kind of sushi, and have a catch together outside (hint to my delightful family: I could really use my own baseball glove if you haven’t picked me out a Mother’s Day gift yet!). I’ve learned that each of my kids has inherited different personality traits from me, which I sometimes simultaneously admire and despise. One son loves to read, while the other could sing all day. One son is desperately hard on himself, while the other worries that the house will burn down. One son can’t keep his backpack or room neat, while the other has a fiery temper. Both of my kids, thankfully, have a well-developed sense of humor. I don’t know what I’d do without that. I’ve learned that I’m not a perfect parent. But I’ve also learned that I don’t have to be. I do my best, and sometimes I screw it up. Sometimes I screw it up pretty badly. But I apologize for my mistakes, learn from them, move on and try to do better the next time. It’s the same way I tell my kids they should live their lives. Oh, and I’ve learned that the two little boys and one grown-up boy in my life are the best things that have happened to me.